Total oil product stocks in Fujairah stood at 18.134 million barrels as of Monday, down 2.6% or 486,000 barrels from a week earlier, following a sharp draw in middle distillates stocks, according to the latest data from the Fujairah Energy Data Committee, or FEDCom. Stocks of middle distillates were down by more than a quarter to 2.119 million barrels, the data showed. 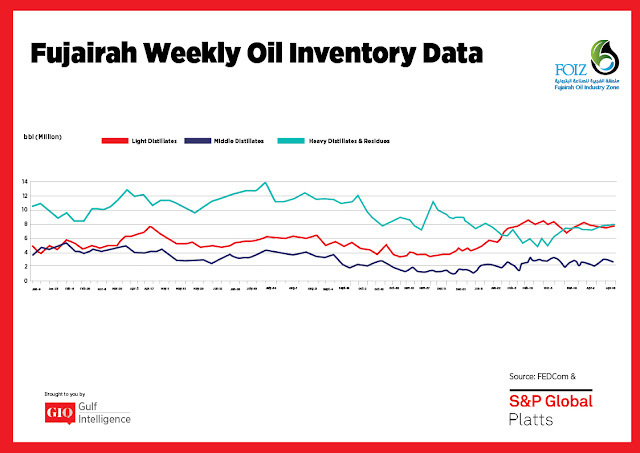 The Middle East gasoil market is currently seen as balanced to oversupplied, but the impending turnaround season at regional refineries has kept a lid on surplus barrels, keeping supply relatively balanced, S&P Global Platts Analytics said in a report. At the same time, sentiment in the jet fuel market has been stronger, driven by supply tightness for prompt barrels as a result of ongoing refinery turnarounds. Still-workable arbitrage economics are pushing jet fuel barrels from the Middle East and India to Europe, as well as from South Korea to the US west coast, Platts Analytics said. A source at a Middle Eastern refiner noted that, while the European market had been encouraging for spot premiums, "demand from Africa is also supportive." Premiums for Arab Gulf Jet Kero were assessed at a five-week high of $1.60/b Tuesday. Stocks of light distillates edged up by 1.1 % week on week to 7.387 million barrels. Demand in the region is expected to pick up with the onset of Ramadan in mid-May. Premiums for Arab Gulf RON 95 gasoline were at a three-month high of $2.75/b Tuesday. However, a sluggish market in Singapore should ensure the Middle East will have ample gasoline supplies available, which should, in turn, keep spot premiums from overheating, the report said. 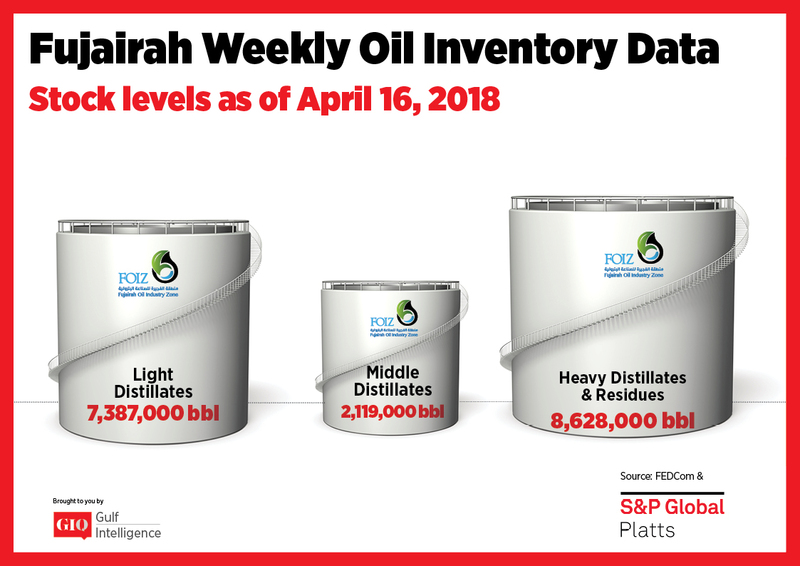 Stocks of heavy distillates and residues also rose by 2% to 8.628 million barrels. Pakistan State Oil has tendered for six 180 CST cargoes of 70,000 mt each with maximum 3.5% sulfur for May delivery to Port Qasim. This is the first tender seen from PSO since January. The company halted fuel oil imports earlier this year due to the startup of a new LNG import terminal, but summer power sector demand could see Pakistan's imports continue over the next few months. The return of PSO to the fuel oil market should be a positive sign for Fujairah, which has historically been the key supply source for PSO's imports. Bunker demand in Fujairah remains sluggish, as higher crude prices have pushed the cost of delivered bunkers to $400/mt recently.